A number of studies to understand impacts on bottlenose dolphins have been conducted over the past five years since the Deepwater Horizon oil spill. The studies have included recovery of dead stranded dolphins and analysis of their tissues, as well as photographic monitoring, remote tissue sampling, and even capture-release health assessments of live dolphins. Collectively, the findings from these studies are presenting a picture of chronic poor health, failed pregnancies, and increased mortality of coastal bottlenose dolphins in the aftermath and footprint of the Deepwater Horizon oil spill. Since the Deepwater Horizon oil spill, dolphins in Barataria Bay, Louisiana, one of the most heavily oiled coastal areas from the Deepwater Horizon oil spill, have had poor health and high rates of stranded, dead dolphins. The year following the spill, health assessments1 of live dolphins in Barataria Bay showed that these dolphins were in poor health. Specifically, Barataria Bay dolphins had evidence of lung disease and poorly functioning adrenal glands. These health conditions are consistent with effects of exposure to oil or petroleum-related chemicals in other animal studies. Concurrently, a cluster of increased dead stranded dolphins was documented in this same area beginning in the summer after the spill.2 In fact, some of the highest annual statewide numbers of dolphin deaths on record for Louisiana, Mississippi and Alabama were seen following the Deepwater Horizon spill. Combined, these studies support that dolphins' exposure to Deepwater Horizon oil and petroleum-related chemicals led to subsequent poor health and death. Preliminary findings also point to potential reproductive issues for the dolphins. Following the Deepwater Horizon oil spill, there have been high numbers of dead, stranded perinatal dolphins in Louisiana, Mississippi, and Alabama. Stranded perinatal dolphins that have been found died either late in pregnancy in the womb or soon after birth. One of the live pregnant dolphins evaluated in Barataria Bay in August 2011 was determined to be carrying a non-viable (dead) fetus. 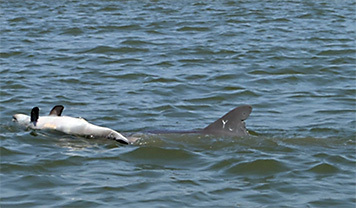 Another of the pregnant dolphins was seen later pushing a dead newborn. Photo-graphic monitoring studies to determine the outcome of pregnant dolphins evaluated in both Barataria Bay (2011, 2013, 2014) and Mississippi Sound (2013) are being conducted to better understand the extent of reproductive failure. 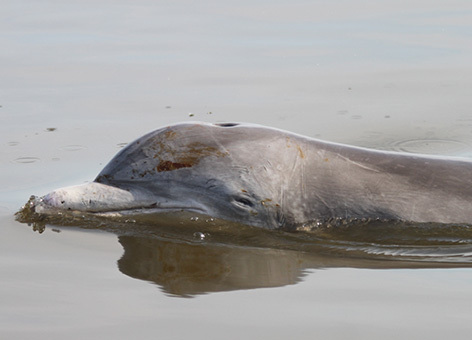 Current evidence suggests that the Deepwater Horizon oil spill is a contributor to the largest and longest lasting dolphin die-off on record in the Gulf of Mexico.3 First, since the spill, annual elevated numbers of stranded dolphins match coastal areas that received the heaviest oiling (Louisiana, Mississippi, and Alabama).2 Second, lung and adrenal disease found in live Barataria Bay dolphins are consistent with effects of petroleum-based contaminant exposure in other animals.1 Third, there is a lack of evidence for previously known or alternative causes of die-offs of Gulf of Mexico dolphins, primarily morbillivirus and marine biotoxins.3 In addition, concentrations of legacy contaminants such as PCBs and persistent pesticides that have previously been linked to adverse health effects in marine mammals, have proven to be relatively low in dolphins from the northern Gulf of Mexico as compared to other U.S. coastal sites. Thus, the investigation to date supports that the Deepwater Horizon oil spill led to increased mortality in dolphin populations, contributing to the largest and longest lasting dolphin die-off in the Gulf of Mexico. Samples from natural resource damage assessment (NRDA) studies of dolphins in Barataria Bay as well as Mississippi Sound 3-4 years post-spill are still being analyzed to understand potential recovery and long-term chronic effects. Preliminary analyses suggest that some disease conditions are improving with time since the spill but that some chronic disease conditions, particularly chronic lung disease, persist. Analyses to understand the long-term consequences to coastal bottlenose dolphin populations continue. Dolphins are long-lived species that are slow to mature and reproduce, and it could be many years before the full effects of the Deepwater Horizon spill on dolphin populations are realized. For more information, see NOAA's Unusual Mortality Event and Gulf Spill Restoration websites. 1 Schwacke, Lori H., Balmer, B. Collier, T.K., De Guise, S., Fry, M.M., Guillette, Jr., L.J., Lamb, S.V., Lane, S.M., McFee, W.F., Ylitalo, G.M., Zolman, E.S., Rowles, T.K., Smith, C.R., Townsend, F.I., Wells, R.S., Hart, L.B. 2014. Health of Common Bottlenose Dolphins (Tursiops truncatus) in Barataria Bay, Louisiana, Following the Deepwater Horizon Oil Spill. Environ. Sci. Technol., 2014, 48 (1), pp 93–103. http://pubs.acs.org/doi/full/10.1021/es403610f#showRef 2Venn-Watson S, Garrison L, Litz J, Fougeres E, Mase-Guthrie B, Rappucci G, Stratton E, Carmichael R, Odell D, Shannon D, Shippee S, Smith S, Staggs L, Tumlin M, Whitehead H, Rowles T. 2015. Demographic clusters identified within the northern Gulf of Mexico common bottlenose dolphin (Tursiops truncatus) unusual mortality event: January 2010- June 2013. PLoS ONE 10(2): e0117248. doi:10.1371/journal.pone.0117248 3Litz J, Baran M, Bowen-Stevens S, Carmichael R, Colegrove K, Garrison L, Fire S, Fougeres E, Hardy R, Holmes S, Jones W, Mase-Guthrie B, Odell D, Rosel P, Saliki J, Shannon D, Shippee S, Smith S, Stratton E, Tumlin M, Whitehead H, Worthy G, and Rowles T. 2014. Review of historical unusual mortality events (UMEs) in the Gulf of Mexico (1990 – 2009): providing context for the multi-year northern Gulf of Mexico cetacean UME declared in 2010. Diseases of Aquatic Organisms. 112: 161 – 175.